IMS’ placement on the schedule has been a head scratcher to me for the last couple of years. I’m not happy with the Cup regular-season cutoff there, and July 4 weekend there doesn’t do it for me, either. Do I think Indy should be taken off the schedule? No, even though stock-car racing at the iconic track leaves a lot to be desired from an excitement standpoint. But, again, NASCAR on July 4 weekend IS Daytona! Now, that I’ve gotten that out of the way, kudos, NASCAR, on the 2020 Cup schedule. Although Homestead-Miami Speedway has done a beyond stand-up job on Ford Championship Weekend the last several years, I’m all for a move of the championship race, maybe not every year, but at least every few years or so. Then, there’s that doubleheader weekend at Pocono Raceway. It’s definitely something different, but something worth trying. I admit, I used to consider the two Cup Series races at Pocono snoozers, but since those races were shortened, they somehow seem to be somewhat better, at least to me. For those folks who still aren’t took keen on Pocono, look at it this way — one weekend gets Pocono out of the way. 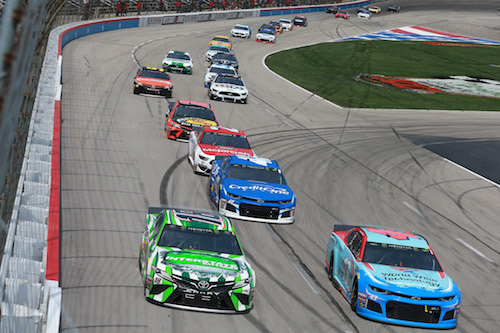 Add in the Xfinity and Truck series companion races to that Pocono doubleheader and you have four races in a span of two days — a NASCAR lover’s paradise, unless you are still one of those Pocono haters I referred to in the previous paragraph. If you’re one of them, back to that “one weekend gets Pocono out of the way” mantra. Back to my short-track love-fest. I’m happy to see all three short tracks — Bristol (Tenn.) Motor Speedway, Richmond (Va.) Raceway and Martinsville all in the playoffs. Three short-track races in the playoffs sure break up that 1.5-mile monotony. Then, throw in the return of the Charlotte (N.C.) Motor Speedway “Roval,” and there’s your playoff road-course race. Oh, and speaking of Martinsville, another thing that has me excited — Martinsville under the lights! Okay, I’ll just leave it with that and cross my fingers for at least one of the national series at the fairgrounds in Nashville in 2021 or ASAP.